With its unique heat transfer system and elegant design, the Rainier towers above other wood burning stoves in its class. Featuring both radiant surfaces and a convective heat exchanger, the Rainier can heat up to 1,800 square feet. 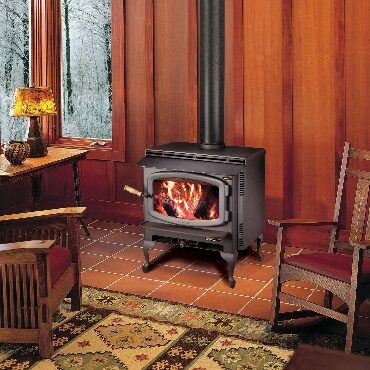 This stove's large firebox can accommodate logs up to 20” long and is great for overnight burns, yet it is still one of the most efficient medium-size wood stoves ever tested. The Rainier is also remarkably easy to maintain and operate, with a single air control that adjusts the heat output. Approved For: Outside Combustion Air, Mobile-Home Installation, Alcove Installation, Hearth-Stove Installation.